I've been quite slack in the last couple of weeks with blogging. 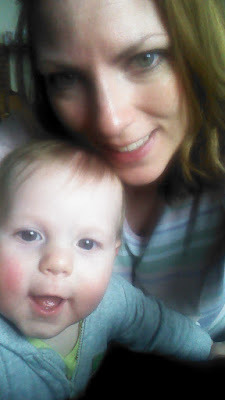 I've had a baby full of cold and then my husband contracted the dreaded 'man flu', combine this with a return back to University, studying, juggling motherhood and life it really hasn't left me with much time to myself! However, I'm starting to adapt, the real challenge will be when I return to placements and need to complete a portfolio and an exam *stress!*. Here is a couple of recent pictures of me and my gorgeous little man who is rapidly approaching 10 months, cannot believe in a couple of months he will be 1 year old........madness. This little bean has made some incredible developmental leaps in the last couple of months, I absolutely love watching all the new things he learns to do everyday. He can now crawl with such speed I have to really have eyes in the back of my head! He can pull himself up, confidently walk with his walker, occupy himself with toys, remote controls, my phone etc amongst other things! The best thing he has learnt to do recently though is starting to form sounds that are beginning to sound like words. He can now say Mama, well I say that it often comes out as bramma ma or bumbum.....but it's fine I can settle for being bramma! 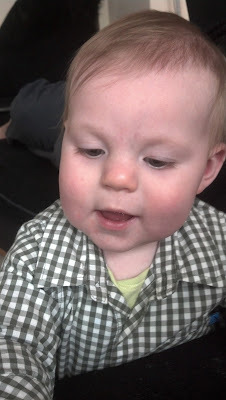 His personality is really starting to show now, he is such a little man with a huge personality.Incredible. He's also growing at alarming rate too he only seems to be in clothes five minutes before he's in the next size! Alfie will be starting Nursery for 2 days a week in April, I'm confident he will be fine but I'm not looking forward to leaving him initially, I think I will be finding it more of an emotional challenge than him! He's such a happy little chappy that I'm certain he will love it. My promise is to blog more often, it's more of a promise to myself more than anything! Its difficult to think what direction to take this blog in, something which maybe requires more thought! For now it is bed and book time.